compressed air system assessment at Trulite. The Trulite Glass and Aluminum Solutions manufacturing plant in Ontario (Canada) manufacturers high end commercial glass products in it’s high tech production facility. The facility uses a large amount of electricity to manufacture laminated glass in the autoclave process. This process is the largest consumer of compressed air in the facility which made compressed air a major target in reducing energy costs for the facility. As the volume of compressed air in the autoclave is significant, the system is constantly pressurized with large 150 HP air compressors to reduce production times and fill times of the autoclave. The current compressed air system operates as two systems. The autoclave system uses 190 psi which consists of two 150 hp fixed speed air compressors that are used to pressurize the large autoclave vessel during the lamination process. The plant side that operates at 110 psi to supply various manufacturing and lifting processes which uses a 150hp variable speed compressor. One PRV is connected between the two systems which allows for higher pressure air to be supplied to the plant system via the PRV at 110 psi in the event the plant compressor needs repairs, etc. In theory, this works well until the autoclave indexes which creates a huge draw of air which drains the system near the 75-80 PSI mark before recovering. This in turn shuts down production equipment due to the minimum requirement being 95 psi to the plant processes. The low pressure system had no storage installed to buffer the oversized variable speed compressor which when combined with the load being less than the minimum output of the compressor caused large pressure swings. The compressor virtually operated in a load/no load manner starting and stopping constantly to try and maintain a steady pressure. The high pressure system had one air receiver which was placed beside the autoclave to try and buffer the pressure swings caused by the filling of the vessel during the lamination process. The size of the receiver was not sufficient to stop the pressure from decaying beyond the clients needs during the initial fill which caused quality issues and alarms. Secondary to the HP process issues caused by the lack of storage, the compressors ran inefficiently as they were always running unloaded to be ready to produce air and keep the pressure up. The idle times had been set to long and load/unload setpoints set so close that they could never stop and go into auto restart. The service provider explained to us that these settings were in place to try and keep the pressure up during various purge and process events in the autoclave, having the units off and restarting to provide the air requirement took to long to do so. Typical autoclave system CFM trend over 24 hours showing large gaps between the cycle requirements. Pressure graph for autoclave cycle showing the decay of pressure due to the large draw of air. Regardless of the path we chose for this system the 150hp VSD compressor that was ramping up and down to supply air to the plant system had to go. The plant load was well below the minimum for this compressors output which was causing drive issues due to the ramping as well as consuming much more energy than needed. Our analysis via the Airleader audit system provided us the information we needed to choose a correct size of machine. A 60hp VSD was chosen for the plant demand which would allow for some growth while providing the right amount of air in the best power curve of the VSD. 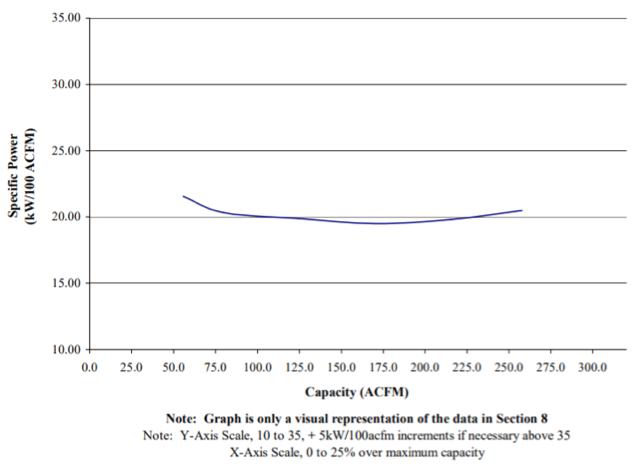 Specific Power charts from CAGI Data Sheets are very useful. The plant side [LP] system was given storage to allow for 5 gallons/ cfm of air required and provide a smooth system for the VSD to trim. On the autoclave side of the [HP] system we recommended tripling storage from 2560 to 7680 USG. This allowed time for the compressors to respond when the autoclave began its large fill requirement. Secondary to this, the new storage now allows the HP system to back-up the LP plant system without issues in pressure which is done via a regulator controlled from the Airleader master controller which regulates air to the plant side if the plant compressor should fail and the plant pressure gets to 95PSI. This also provided savings to the client by not having to bring in rentals for a compressor issue in the plant as well as eliminating the cost of purchasing a backup unit. With the previous system the storage was not enough on the HP system causing the pressure to decay to 75-80 psi before starting to recover during an autoclave cycle. Now that the system has more storage the pressure never decays below 100 psi allowing this air to be regulated to the plant side at 95psi eliminating need for the purchase of a backup compressor. The autoclave system had many variables including the initial surge to fill the large autoclave vessel, some additional purge air, as well as varying requirements for variances in product. Different products had very different pressure and flow requirements for compressed air. Knowing this information we knew right away a master controller was required if we wanted to stop compressors and choose the right compressors to fulfill the process. After analysing the variances in product requirements via the Airleader software, along with information provided by the plant, we decided on a 60hp VFD to trim the cycle purges and work within the requirements of each product recipe. The existing two 150hp compressors would be used simply for the initial surge and one unit for a particular product that requires a secondary fill. Although a 60hp VFD trimming against a 150hp fixed speed would normally put the system into a large “control gap”, this process is unique in which a small VFD covers the complete process properly for leaks and short purges that require small amounts of air. A large VFD would be below its minimum much like the old plant system VFD was. The client procured the compressors and tanks along with an Airleader master controller which was then implemented. Once installation was completed Compressor Management Inc. took over the commissioning and setup of the system to operate as simulated by the Airleader software. The new system no longer runs the 150hp in constant idle to trim the purge on the autoclave and pressure issues have been eliminated. In fact, more than 90% of the time the two 150hp units are now stopped and off waiting for the Airleader Master Controller to give a start command when required resulting is secondary maintenance savings benefits. The client now watches his system from his desktop via the Airleader webserver and calls for assistance long before a breakdown or production is interrupted by a compressor problem. Maintenance Manager John McGraw (far right), receives on behalf of Trulite, a $147,428 (CND) energy incentive check, for the compressed air retrofit project, from representatives of the local utility company. Now that the technical reviewers have completed the post analysis, the client has received the $147,428 CND incentive cheque for the project from the local utility supplier. The system now runs trouble free with online visualising of the whole system ensuring reliability and peace of mind while providing a total energy reduction of 83% which reduced the kWh’s by 2.3 million annually. For more information contact Alan Brossault at email: abrossault@compressormanagement.com. For more information on Airleader master controllers visit www.airleader.us. To read similar Glass Industry articles visit www.airbestpractices.com/industries.